Tile, yes please! — Kitchen remodelingBaywolf Dalton, Inc.
Tile is so much more than functional, it's fun, it adds interest and texture and pattern. This bathroom with it's sophisticated finishes is kept fresh with the addition of this concrete wave It's projection and shape just makes you want to touch it. The limestone tiles are also used on the entire wall and finishes the window jamb (seen in the mirror) instead of wood casing. There are some spaces that look terrific having the tile or stone fill the entire wall for a continuous element in the room. This 1907 home felt as though it needed true craftsman tiles in the back and shower. These striking tiles were made right here in Georgetown. The floor is a basket weave pattern of Calacata marble and honed logos stone. The shower pan was also done in this basket weave material. The cabinetry is Rutt Regency, a khaki stain on mahogany, glazed and then sanded back on the edges to show a hint of the burgundy wood. This 1907 home felt as though it needed true craftsmen elements with the architecture of the home. These striking tiles were made right here in Georgetown. The floor is a basket wave pattern of Calacata marble and honed logos stone. The shower pan was also don in this basket weave (shown below). The ceiling of the shower matches the curb done in matching Calacuta marble tiles. The cabinetry is Rutt Regency, a khaki stain on mahogany with a glaze and then sanded back through on the edges to show some of the burgundy color of the wood. The top coat is a flat ten percent sheen. Pulls are from Sun Valley Hardware. The plumbing is Kallista Tuxedo with matte black reeded handles in a nickle silver finish. They are stunning. The details make all the difference in the final look. The single frosted shitake tile color is clean enough to work well with a patterned floor. The shampoo niche has the added touch of a pencil trim mitered at the front edge all all sides. The floor is heated for those cold mornings. Tile adds character, texture, it can be elegant or just fun like the floor shown below . I haven't even touched on the prep work that goes into these beautiful rooms. Dry packed shower pans, water proofing and specialized grout that never needs sealing. The small area shown below demonstrates how you can create a feature area in the kitchen. I had the mosaics made in this pattern and scale from Calacata marble, clear and grey glass. Each piece was cut with a water jet and pieced together to form the pattern. When you stand to the side you can actually see the full edge of the stone. 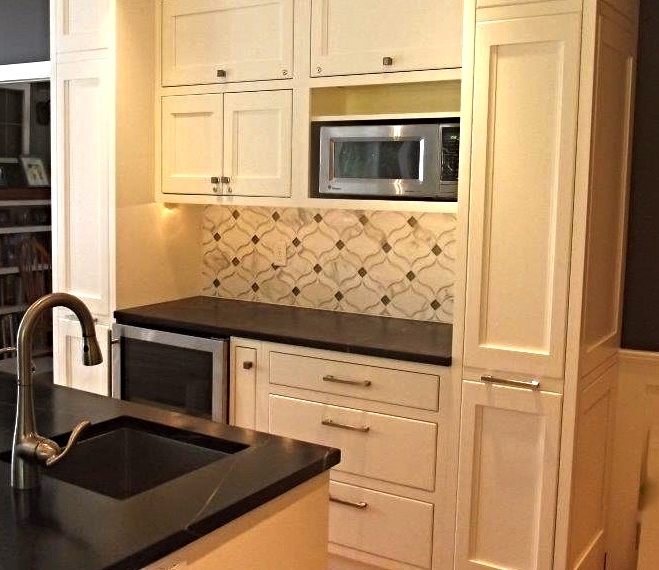 Combined with the soap stone counter top and white Rutt Handcrafted cabinetry it was a beautiful project. Older PostIs there anything new for counter tops? Yes!